My temperature sensor was replaced, and they also discovered a few other issues......bad crimps on connections; so to play it safe, they gave me a new replacement machine! Hats off to espresso planet for great customer service! Thats a lot of scale for one months use on low mineral water. I am moving the next post here as it was posted under the wrong topic. It was a highly variable temperature indication that deteriorated over a few weeks. I took a video of the display. Chris Coffee sent me the new sensor very quickly but since I had left the machine off for about 12 hours and turned it back on it was pretty stable, so I waited to replace the sensor. The last couple of days I noticed when I ran water through the boiler tap the temperature on my group started doing some serious wandering, I contacted CC just in case the new info changed their assessment and it hadn't. Just replaced the sensor and the machine is stable again. The sensor looked similar to yours and we have very soft water which I'm running through a Bestmax M purifier. CC asked for the bad sensor back so they can send to the company to figure it out. Glad to be back up to spec! Resurrecting this thread. Its been a bit over a year since I was given a brand new Dream "2.0" (the updated version of the dream). It has been working like a champ up until yesterday, making probably 2 espressos, 2 lattes per day. Yesterday, the early signs of the brew boiler temperature detector failure occurred. Just as a reminder, the symptoms begin with the indicated temperature instantaneously changing from 160 to 195 and back again. In the early stages, this only happens a few times and then the control settles out. In my experience (and unfortunately I have lots), this deteriorates to the point where the indicated temperature is unreliable and the actual temperature goes to boiling, and you get steam out of the grouip head. So, back to the retailer it went. I chose not to touch it since its still inside its warranty, and I'd rather they deal with it and report back to CCS and La Spaz. So, I would be very interested in others who have experienced this on their new version Dreams. I think La Spaz fixed a lot of the other issues on the first generation Dreams, but my suspicion is that the temperature sensor is the same. I still wonder if your original problem was really related to temperature sensor failure. We have had the occasional person need a sensor replacement over the years that this forum has been around, but no one like you where every replacement sensor also failed in the same way. Normally those sensors fail "open" when they fail. However, the main issue that the big Dream fix was supposed to resolve was due to steam - mostly from running the hot water - getting up into the controller box which is attached behind the display. Pre-Dream those controller functions where all in the black box at the bottom right rear of the machine so this had never been an issue. Their fix was to put a piece of mylar on the back side of the controller board and then use some sort of moisture resistant tape to seal it around the edge of the controller board. It is possible that the tape seal has broken or the mylar has cracked and you are back having a moisture related problem with the temperature probe. At any rate it will be interesting to hear back from the repair folks. Let us know what they say. If all they do is replace the temperature sensor and the problem is really that the original fix didn't work, you'll probably see the issue happen again before too long. You must be starting to feel "special" with having one of the worst of the first generation lemons and now having the first 2nd generation machine to fail in the same way! Yup. I am very worried that I am going down the same rabbit hole as before. I agree that usually these sensors fail open (I guess that would be an offscale high temp). In my case it acts like it shorts out at a particular temp. So, if you just do a blank pull, you see the indicated temp fall from the 200 setpoint, and when it hits about 194, it suddenly changes to 160. Then as the heating element comes on and heats the water up, it rises, and then overshoots to over 210. So, yes who knows what the real answer is. I am not exactly a super heavy user, I keep the machine clean, and there is nothing weird about the positioning on the counter. And yes, if I ever work up the nerve to buy a new machine.....La Spaz would not be on my short list. I also notice that CCS now stocks the Dream Temperature sensors as standard spare parts available on line.................interesting. They replaced the steam and brew temp sensors. The machine is working OK now. Watch this space for updates if or when they fail again. According to the retailer, this is the one issue that hasn't been fixed on the dream 2.0. They have done this with others machines as well. So for them its the sensors not the circuit board. Sure would be good to hear from others with the newer dream versions to find out how common this is. Many of you have read about all the troubles I've had with my Dream's (I had the original version, and my retailer replaced it with the newer 2.0 Dream). I continued to experience periodic failures of the brew temperature sensor. This tended to occur about every 6 months of use. As well, I have reported that the steam boiler inlet solenoid has experienced frequent plugging, with tiny bits of metal. I believe I have finally got to the root cause of this (certainly still afraid of jinxing myself, but here goes!). I have developed a theory as to why this is happening, and so far, the latest sensor has been ok. When I bought the original Dream, I also bought a water treatment filter (Bestmax BWT filter). Its an integrated carbon filter, softener. Because of how it works, it tends to drop the ph of the water to acid levels (my intake was 6). I believe that the material selection in the Dream makes it susceptible to an electrochemical galvanic reaction at the temperature probe and also material degradation causing small bits of metal to come out of the water path and plug the solenoid valve, because the brew boiler water is acid. (The exact same probe is used in the steam boiler and it has never failed. The steam boiler does not get to the same low ph because of the concentrating effect of the steaming in the boiler and the buffering nature of the alkilinity). So, I changed out the Bestmax filter and switched to the CCS 10 inch carbon filter and softener package. The result is my water is now at about ph 7.8. And the temperature sensor has not failed again.......yet. 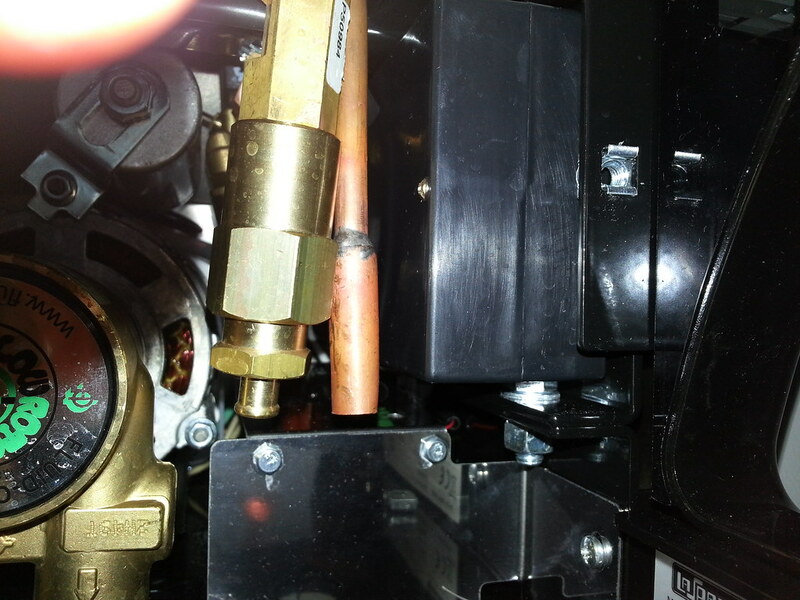 The plugging of the solenoid valve has stopped as well. I think this effect is highly dependent on inlet water conditions. So, this may not occur with most others, either because their water treatment is the CCS system, of their local water conditions are different. I've noted on this forum that the only other person that reported temperature sensor failures, used the same Bestmax filter system. Well. I'm going to resurrect this old thread. Yesterday morning had the same issue occur on the group sensor. My symptoms are the the temp varies wildly but the heating element stays on. Then it detects the failed sensor and alarms. I pulled the sensor and it was calcified like goodboyr's picture. I tried cleaning it up with vinegar, and replaced it with no luck. It's definitely the sensor as I swapped the leads with the steam boiler's sensor temporarily and I don't get the wild temperature fluctuations. Yup. It's good that you are talking to CCS. They are aware of this issue and have communicated to LA spaz in Italy. I have sent them a bunch of my failed sensors. All of my previous theories are just that....theories. Bottom line is that these eventually fail. LA spaz has no answers yet. The new sensor was "silver" vs the one I cleaned which looked bronze or cooper (referring to the part that goes in the water). I'm not sure if originally the sensor tip was stainless/chromed or whatever metal it is. 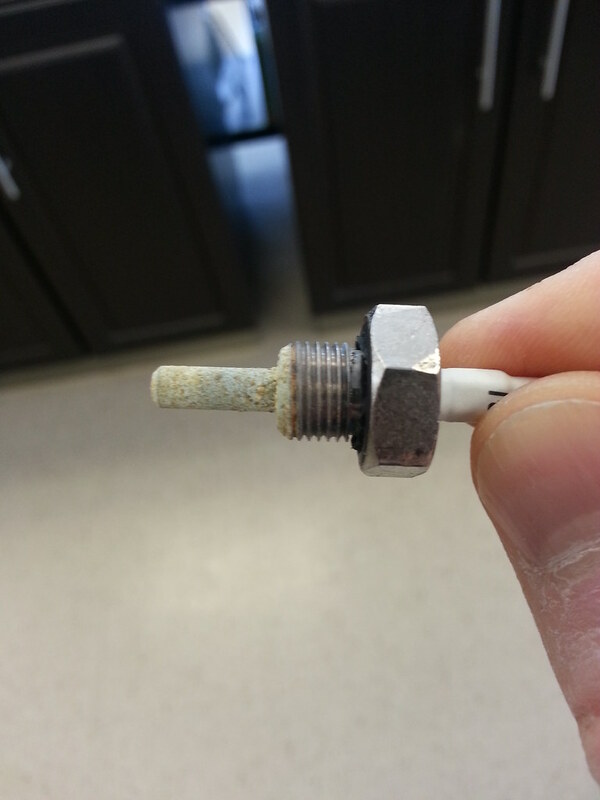 But if so maybe there's some galvanic reaction/corrosion occuring that destroys the the sensor (maybe pH related). Anyways a total guess but a thought. I've had both kinds fail on me. But I'm still going with the galvanic corrosion theory. My most recent one had a small spot with deposits on it and underneath the deposits the metal was shiny. All the rest of the probe was a uniform thin black deposit. goodboyr wrote: I've had both kinds fail on me. Agreed. I think you are spot on. I've ordered a couple of sensors as spares for the inevitable failures. I'm going to experiment with one. If we assume they are brass, I will attempt to intentionally create an oxide layer to protect it from corrosion. Going to use ammonia to do this. The idea is that if it has a uniform oxide layer, there won't be a place for the galvanic corrosion to occur since the oxide layer is non reactive. Will report back. Since failures take anywhere from 3 - 6 months of operation it might take a while. Well, the ammonia experiment failed. And heres a pic of the latest failed sensor. Clearly electrochemical corrosion happening. Brand new CCS softener and filter and my water tests fine. So another email to Tim at CCS to see if there's news from LA spaz. Maybe they need to break down and provide you with an old style sensor. Those have a metal cylinder that sticks down into the water. Then the sensor is pushed down to the bottom of the cylinder and tacked into place with silicone rubber. That way the sensor never gets wet and the problem goes away! Makes sense. Sounds like the old design was superior. I just wish they would deal with this. Water chemistry is a lot more involved that just correcting for hardness. I wonder if your water has something else going on. Have you checked the pH? Is the water naturally soft or has it been softened? I grew up on a brackish river. Due to the salt content of the river, the local marinas had to install submerged electronic "cathodic" devices to prevent propellers and metal rudders from corroding. I almost wonder if something about your drinking water's chemistry is causing this effect. If so, using the other style temp sensor would be a fix as would using the same style sensor but made out of stainless steel. I don't believe LaSpaz is buying this as a sole sourced part. I wonder if there might be another source that uses a stainless steel body. On the other hand, I know that some models of the S1 are still using the old style sensor so I have to believe that part(s) is still available. It's an interesting issue. I'm in Toronto, and the water here is "average". Nothing out of the ordinary, and I'm sure I would have heard, given the huge number of espresso enthusiasts here. I have been talking to CCS who are aware of this problem. On their request I've sent failed sensors to them to forward to Italy. No word yet from La spaz. I might order up a Vivaldi sensor to try. One thing I'm not sure of is whether they are pt1000 sensors too. I assumed they were pt100 sensors and la spaz moved to the pt1000 for the dreams. The way to know is to measure the resistance. From the.looks of the sensor I agree that what is happening here is a galvanic reaction. Appreciate the thought and discussion on this. I know there are others experiencing the same issue, but it's not universal. BTW. PH is slightly above neutral after the filters and softener. But note that pH changes dramatically with temperature. goodboyr wrote: BTW. PH is slightly above neutral after the filters and softener. But note that pH changes dramatically with temperature. Part of me is starting to think that it's actually the softening filter that's causing it. I use the same one you do and had the same issue. I believe la spaz now recognizes there's an issue with the existing design and is working on a fix. Just as an update to this long saga. As some of you know, my Dream suffered from successive failures of the brew boiler temperature sensor. I typically could get no more than 6 months out of a sensor before the machine showed erratic temp readings, culminating in the dreaded "Failed Brew Sensor" message. Chris Coffee has been fantastic as usual (thanks Tim!) in supporting me on this issue, and I helped by sending them some failed sensors so they could problem solve with La Spaz in Italy. About a year and a half ago, they kindly sent me a new prototype sensor that they felt would deal with the issues I was experiencing. To be specific, there is an electrochemical corrosion effect happening at this sensor, and even with pristine low hardness water, deposits start to build up on the sensor and eventually under deposit corrosion breaches the sheath and shorts out the rtd. The new prototype was "T.E.A." coated which is a process that deposits nickel coating on the sensor. Nickel is extremely resistant to corrosion. This sensor works well and lasts much longer (18 months plus). I was sworn to secrecy at the time but CCS now stocks the new sensors with the TEA coating. They have not updated their parts page with pictures of the new sensor, so I've attached a picture here. The new sensor has a red strain relief instead of white and the metal is shiny (due to the nickel coating).